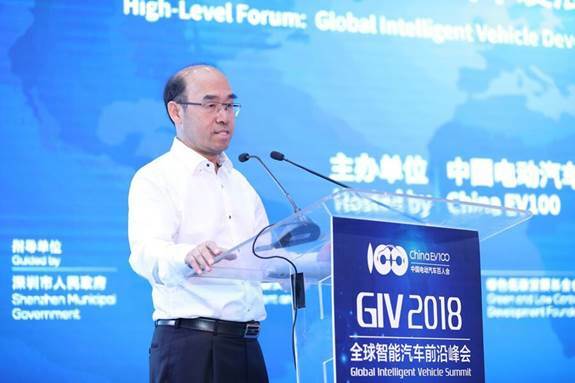 On June 20, 2018, Xu Changming, Vice President of the State Information Center, attended “GIV 2018 Global Intelligent Vehicle Summit” upon invitation and delivered a keynote speech on “Trend of Intelligent Vehicles in China”. The Summit was hosted by ChinaEV100 and guided by Shenzhen Municipal Government. From the perspectives of supply, demand and policy, Vice President Xu Changming made a judgement on the prospects of China’s intelligent automobile: Overall, the potential for development is enormous but there still exist challenges brought by mixed traffic. On the supply side, leading automobile enterprises at home and abroad have successively released intelligent automobile product plans under the trend of electrification of automobiles. Major parts companies, internet companies and financial institutions also have participated in promoting the market development from various facets. On the demand side, China's national conditions entail greater potential demand for smart vehicles than that in foreign countries, in that we have larger vehicle population, higher population density, stronger momentum of automobile sharing and younger consumer groups. In light of policy, the government can make great achievements in all aspects of the development of smart automobiles, including communication network, big data, cloud platform, high precision map and intelligent transportation, etc. ; currently, great efforts have been made in pushing forward road tests. Despite the huge potential in general, China’s intelligent vehicle industry still faces challenges brought by mixed traffic, such as the safety issues caused by the coexistence of autonomous and non-autonomous cars on the same road or the coexistence of motor vehicles and non-motorized vehicles in the same lane. With the theme of “the Development Course and Path of Global Intelligent Vehicle”, the Summit convened policy-makers, experts, related businesses and representatives of investment field, a total of about 600 persons both at home and abroad. They held joint discussions on innovative strategies for China’s intelligent vehicle, with the aim to construct an “efficient, green, smart and friendly” traffic system.